The 2018 High-Level Political Forum on Sustainable Development (HLPF) took place from 9–18 July at the UN Headquarters in New York under the theme: “Transformation towards sustainable and resilient societies”. Goal 17: Strengthen the means of implementation and revitalize the Global Partnership for Sustainable Development, that will be considered each year. In 2018, 47 state are undergoing their Voluntary National Reviews (VNRs), including several countries with indigenous peoples (such as Australia, Bhutan, Canada, Colombia, Ecuador, Mexico, Namibia, Niger, Paraguay, Republic of Congo, Sri Lanka and Uruguay). Find information on the VNRs and the the full list of countries here. 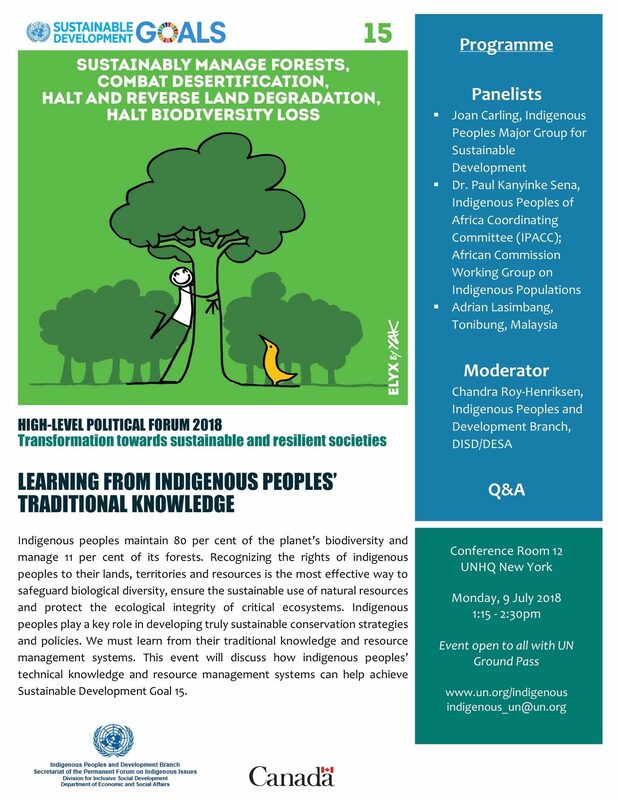 The Indigenous Peoples and Development Branch/Secretariat for the Permanent Forum on Indigenous Issues hosted a side event on “Learning from Indigenous Peoples’ Traditional Knowledge“. The event was co-sponsored by the Permanent Mission of Canada. See the flyer below and watch the stream of the event on our Facebook page here. The Branch, with the Department of Public Information, also organized a Press Conference on Monday, 16 July, on the topic: “Is the implementation of Sustainable Development Goals respecting the rights of indigenous peoples?”. Speakers included the Permanent Forum member, Tarcila Rivera Zea, the Special Rapporteur on the rights of indigenous peoples, Victoria Tauli-Corpuz and community activist from the USA, Janene Yazzie. The SDG Media Zone (16-17 July 2018) included an event on “Indigenous Peoples and Agenda 2030” on Tuesday, 17 July 2018, 2-2.15 pm. For more info, see the SDG Media Zone programme here. The Indigenous Peoples Major Group for Sustainable Development (IPMG) and the International Work Group for Indigenous Affairs (IWGIA) co-organized an Indigenous Voices media zone at the HLPF on 11 and 18 July 2018 at the UN Correspondents’ Association (UNCA) lounge. 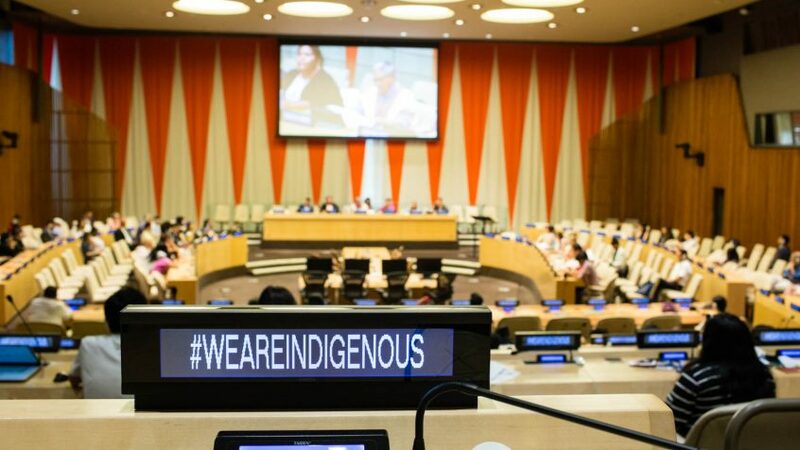 Find the list of events and bios of indigenous representatives at the HLPF, see here, along with other events of the Major Group at the HLPF on their website. For more information, contact Mr. Prabindra Shakya (shakya@un.org).